I have to confess, for a good chunk of my adult life dinner consisted of tortilla chips and salsa. Carbs and veggies right? Prep time: Zero minutes. Clean up: 30 seconds. If I was feeling particularly ambitious, I would pick up the phone and have someone make me a pizza. In my defense I spent a good part of my 20s as a modern dancer (read: waitress) and then 3 years in grad school. Neither lifestyle is particularly conducive to a healthy diet or regular meals. Plus, cooking an actual dinner with multiple food groups and ingredients always seemed like a waste of effort when it was just me eating. But now that I have a family, and people to notice and enjoy my efforts, I've become bona fide cook. I plan and prepare dinners that include sides. God help me, this week I made breaded tilapia with a homemade pineapple salsa and garlic mashed cauliflower potatoes. Here in Kenya I'm also forced to make a lot more from scratch: salad dressings, sauces, tortillas, naan, pizza. It's fun, a creative outlet, and I'm not half bad at it. But one thing I cannot get here is a good sweet potato. You can easily find what are called "viazi tamu" (literally, sweet potatoes), but they are nothing like what Americans picture. They are large tubers with white flesh and little sweetest to speak of. They also lack the nutritional benefits of their orange fleshed counterparts. Slight, and probably negligible, inconvenience to this budding gourmand. Huge problem for the nutritional status of my country-mates. marshmallows at the Thanksgiving table) can help make up this difference. 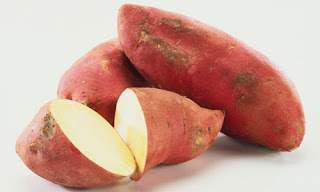 For example, certain varieties of sweet potatoes can help fight vitamin A deficiency, which contributes to high rates of blindness, disease, and premature death in children and pregnant women and threatens an estimated 43 million sub-Saharan children under age 5. That's a pretty powerful potato. In my province of Kenya, the Sweet Potato Action for Security and Health in Africa or (SASHA) is providing vouchers for sweet potato vines to pregnant women, with the double benefit of encouraging pregnant women to seek pre-natal care and to eat, sell and feed others micronutrient-rich food. Still, food preferences are often stubborn and slow to change. Even hungry people will sometimes refuse unfamiliar food - especially people who are used to a staple food. An informal survey of my Kenyan friends tells me that the sweet potato juggernaut has not penetrated our area. But I have hope. Kenyans often describe food as "sweet" the same way we would call it "good" or "tasty," as in, "This meat stew is very sweet." I'm taking that to mean there might be a cultural preference for sweet, as opposed to spicy or salty, food. This bodes well for Old Orange Flesh. And newly introduced crops can quickly become preferred. Let's just say Italy knew not the tomato until it made it's way from the New World. The sweet potato might have just a bright a future here. So, while this is decidedly not a food blog, to honor this cause, I'm going to share one of my favorite recipes with you. - Add black beans and sweet potato and cook for another 10 minutes. This is your filling. 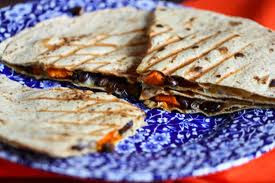 - Heat up your oil or butter and layer tortilla - cheese - filling - cheese tortilla. Cook for 2-3 minutes, flip over and repeat on other side. - Serve with salsa or sour cream. It was near impossible to find any sort of sweet potatoes in France. Now that we are back in the states I'm making up for lost time, thanks for the recipe! Don't forget Grandma's tsimmes recipe and sweet potato fries!